I started reading to my daughter long before she was born. I have always loved books, and I knew that instilling a love of books in my children was important to me. Kids need your time and reading books to them is such an awesome way to spend time with them. They learn to associate good things with books which helps them in the long run. These three Bright Books board books for toddlers are ones your little ones will love because they are touch and feel board books. Thank you to the publishers for providing these for me to review. Join a young bear and his mother for their very busy day in the forest with Bright Books: Baby Bear’s Busy Day. This visually stunning board book features bright neon elements, soft touch-and-feel bears, and shiny foil that will capture baby’s full attention and imagination. With sweet, soothing text and gentle illustrations, this engaging board book will become a bedtime favorite. Follow along as baby bear has a day full of fun! This book is adorable. I love how it goes through the sequence of a day because that really helps children understand the flow of time. From the day they are born, children are learning. If you can make that learning fun, they’ll learn to associate learning with fun! This board book for your toddlers is really sturdy, so you can allow your little one to handle this book alone without worrying about ripped up pages! Swim along with Bubble in the deep, blue sea in this board book for toddlers: Bright Books: Bubble’s Ocean Friends! Follow Bubble on her adventure and discover turtles, starfish, crabs, and more. Lively rhyming text, bright, colorful illustrations, and shiny foiled details invite young readers to have hands-on story time. 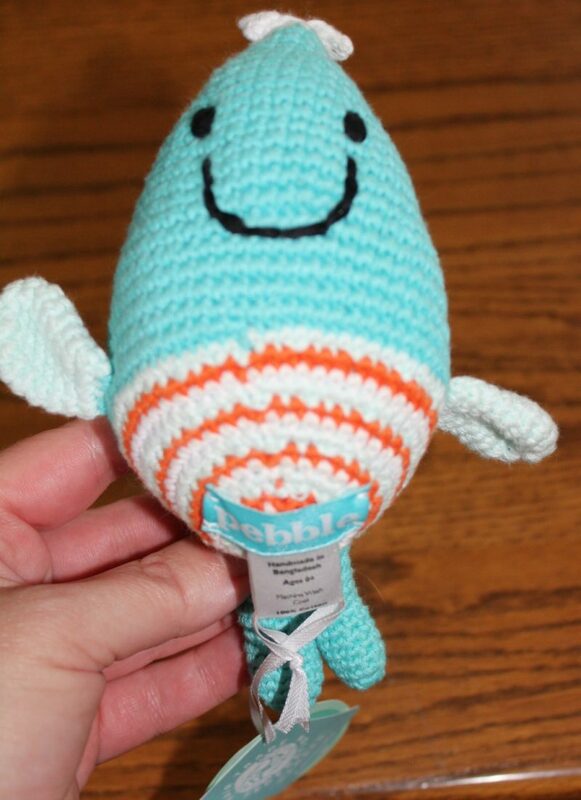 Page after page, babies and toddlers will have fun counting all of Bubble’s new ocean friends. This one is my favorite of these board books for toddlers! I love the ocean, and blue is my favorite color. Bubble is so cute. In this book she counts the things she passes, so this will help your little ones learn counting before they can even talk. Again, this is very sturdy, so your child can play with the book alone. Shadow is a very adventurous cat, but his favorite time for adventuring is at night. He loves saying hello to the moon, strolling around on rooftops, stargazing with friends, and so much more! Read along and explore the night in this storybook with rhyming text, colorful elements that illuminate the dark, and a soft touch-and-feel cat to guide you through the night. Bright Books: Shadow’s Nighttime Adventure is a delightful bedtime board book for babies and toddlers. All Pebble products are made by Hathay Bunano. Hathay Bunano, meaning handmade or hand knitted in Bangla, is a non-profit fair trade organization in Bangladesh. It’s mission is to create fairly paid, good quality, flexible and local employment for rural women who are poor and often disadvantaged. Hathay Bunano aims to provide employment which fits in with the rhythm of rural life and to prevent economic migration to the cities. It aims to keep families together and in particular to keep mummies with their babies and children by providing employment in a village setting close to their homes. It aims to address all the reasons why a woman might not be able to work and to support her so that she can work and can earn money to support her family. I love Pebble! If you browse their products, I’m sure you will as well. I got a cute little whale rattle. Though it’s not exactly like the one on their site, it is unique. I call it a crab/whale because it looks to be a cross between their crab rattle and the whale rattle. Since these are handmade, I like to think maybe a new mommy was just starting out making these, and this was her project. Your child will love playing at the beach with Pebble toys, and since they’re machine washable in cold water, you don’t need to worry about them getting dirty. Which of the board books do you think your child would like most? What Pebble product would be your favorite? I’d love to hear what you think! Want more board books for toddlers? Check out this review post: Mini Myths Board Books. Aww these books sound totally adorable for little ones, I am loving the little Pebble as well, what a great cause it seems to be helping to. They are so sweet, and the cause is a worthy one! My daughter-in-law is expecting her first child and these books would be a perfect gift. I love the crocheted whale rattle and the fact that they are handmade by poor, rural women in Bangladesh. What a great way to provide employment for the mothers in those villages. It warms my heart! New babies are so exciting! I really love the products from Pebble because they’re adorable, and it is such a good cause! My nephew and niece would love these books. They are the perfect age to read these. The little crocheted toy rattle is so cute. I know what I want to get them for Christmas now. Reading this takes me right back to the early days with my daughter. She would have loved the extra toy! I’m sure she loved being read to too! These are such cute books! My kids are all too old for these, but I’m sure I have friends with kids that would love these books. Mine are too, but there are always babies being born around here lol. We had a ton of board books when my boys were little. I’m not familiar with Pebble but the rattle shown above is cute and has nice colors. Board books are so awesome for little ones. I didn’t think I would miss reading to my kids as I often did when they were little but I do. These are so cute! We absolutely love Pebble! In fact, my daughter’s favorite toy, a Pebble Octopus that she has named Ollie is sitting next to me right now. That’s adorable! I love the Octopus too! 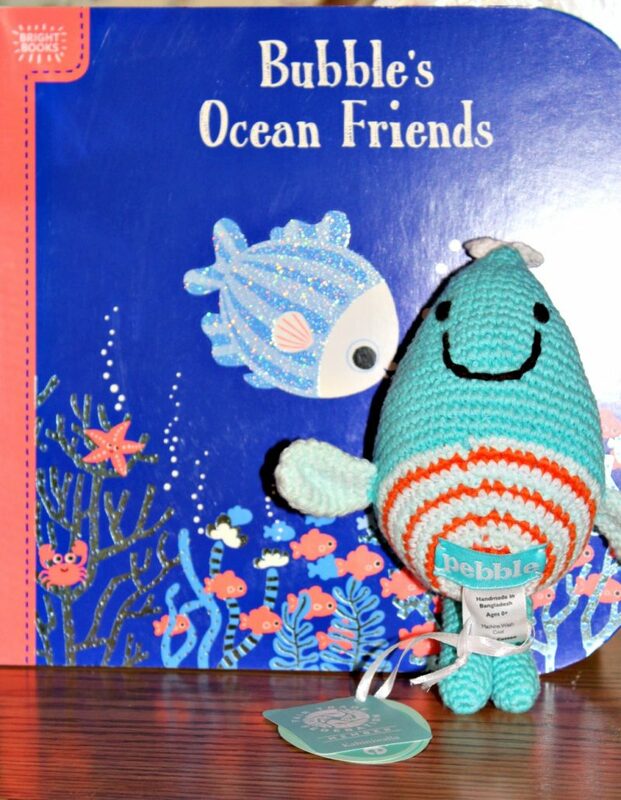 Kids would love the book Bubble’s Ocean Friends. I found it fun to read books to my kids where they were young. I wish we had this counting book back then. Anyway, I would definitely recommend this to friends and family with young children. Counting is fun! Yes it is! I love how cute these are. 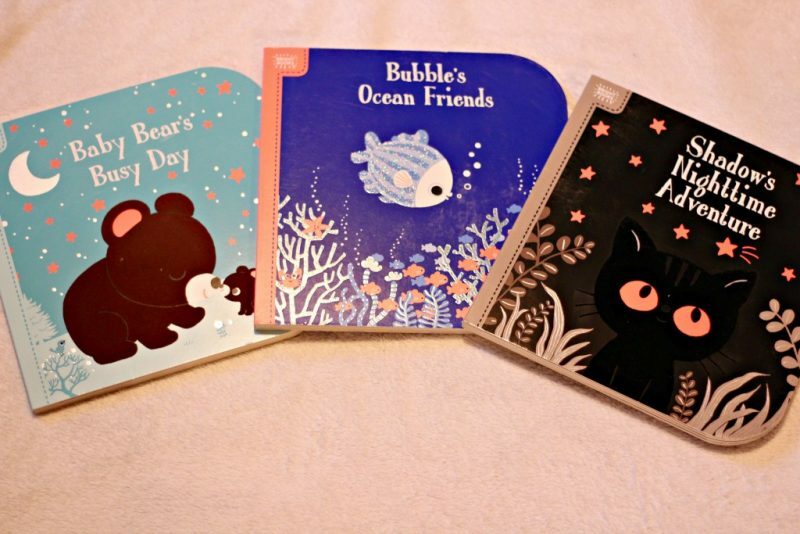 These board books look so cute! I love how they come with a little toy as well. I bet my nephew would love these! I am always on the look out for great books for my grandchildren or any children. Giving a book as a gift is something that keeps on giving and the world opens up. Love these bear books. I think books are such a great gift! I love sharing the ones I get with others since my kids are past this stage. My daughter will be sharing these with her friends’ babies. I read a lot when I was little and my toddler is a reader so I think it is never to early to read to kids and get them into reading. WITH all this technology today, reading books is falling aside. I know it! Books are so much more amazing than any tech could ever be. They let you escape to another world that you create in your mind! Shadow’s NIghtime Adventures seems like a story for my baby. I love what the story is all about. Your baby needs these! They’re so cute! Aww these pebble toys and those board books are so cute and nice. These will be perfect gifts for kids I guess. I am going to show this to my little niece. She loves reading and if she likes it then maybe I will order it. They are very cute! I’ll bet she would. These books are really cute and the rattle is adorable. I have a couple of friends who have 10-month-olds that might like these. That’s the perfect age for these! My daughter is 2 and loves books. She has to take a nap with them everyday, it’s so cute. That whale is adorable too! Awww, that is so sweet! I hope she keeps loving them as much when she is older!